Do these kinglines still exist? Or have the thirty years of alpine sport climbing evolution led by Scheel, Carrigan, Kammerlander and co. only left over “bits-and-pieces” for young climbers? I am driven, want to move, and have to be outside. The nature is habitat, joy, uncertainty, challenge and adventure. The mountains have impressed me the most – in particular, steep, compact walls. The game: to find a free climbable line through these walls. The rules: to climb from bottom to top, without exploring from above first. No technical climbing. To use technical tools only for protection. To follow the easiest way with the least difficulty. If possible use traditional gear. Less use of bolts. Run Out. In the back the Drei Türme and the Eisjöchle glacier. In 2007 I climbed with Jürgen Höfle, the still virgin first ascended route “Drunter und Drüber” by Pio Jutz. An ingenious line, which weaves alternately on slabs and steep passages between big roofs. During the approach a series of blue limestone stripes loomed between an overhanging “roof zone” and caught my sight. “Wow! What a wall! What a line!” I wanted to get up there and began to dream. I tried to imagine how it is to climb the steepest part and asked myself if it´s feasible to free climb. To my disappointment I saw a fixed rope hanging in the line. “Damn!” I was not the first person to be fascinated by this line! After a successful climbing day it was not hard to figure out, who was working on this project. As I already suspected, it was Pio Jutz, one of the most active developer of “high end” routes in a proper style, at this time. I questioned Pio immediately about the project and whether he is still on it. Pio had not worked on the route for some time. He had failed due to wet wall parts at the crux pitch. To use technical climbing to bring him further wasn’t even worth a question. “Are you going to try it again?” I could well understand that it was difficult for Pio when he assigned the project to me. I was super psyched when I arrived at the beginning of the unclimbed territory. Accompanied by Pio I started into the virgin ground. It was anything but easy to master this pitch with hard bouldermoves on very steep terrain. The main problem was to find cliff placements from where I could drill a bolt. After this mental and physical fight I was completely exhausted and we rappelled off. It took me three more days in July 2014th to complete the last three pitches after managing the crux pitch. 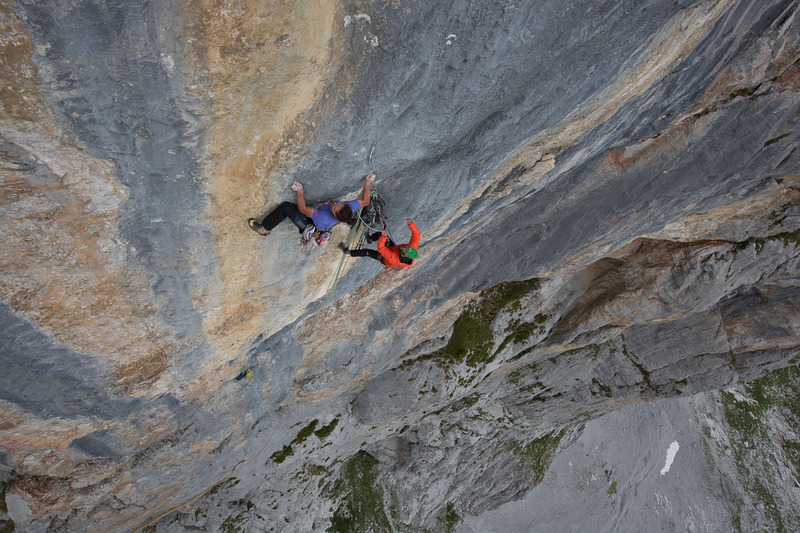 “Wow!” What a logical line on perfect rock, with high difficulties and demanding protection. Two years later I was able to climb the route “The Gift” redpoint in a day. The route is currently my hardest and one of the finest multi-pitch routes in Vorarlberg. One of the most difficult multi-pitch routes in the Rätikon. First ascent from bottom to top- without exploring from above and in free climbing) August 2014. Redpoint ascent of the route “The Gift” one day in July 2015 after two years of project phase. Difficulty 11- (8c) challenging protection.